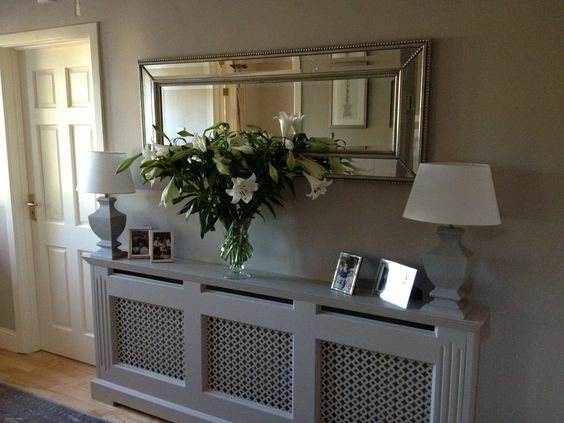 Radiator covers are very successful at disguising or hiding your radiators. Using them to turning your radiators into stunning functional furniture is a great idea and not as difficult as you think; often it more on where they are situated in your room and whether you need a custom made cover or can create something yourself. 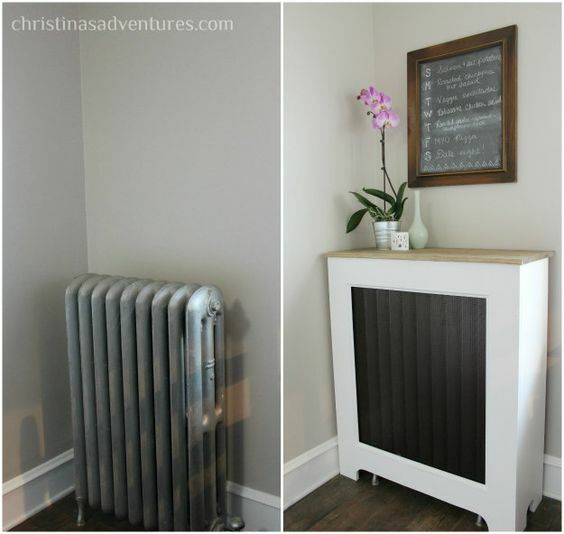 I've written about radiator covers before and thought it was time for an update; something a little more stylish, fresh and modern. 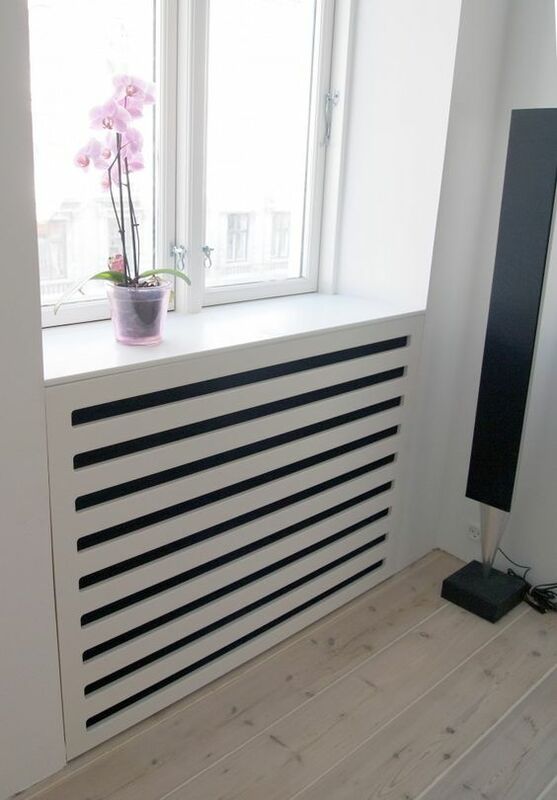 A radiator than runs the length under a window can be turned into a great piece of functional furniture. Once covered with a decorative radiator cover, and with a full length shelf can display your accessories, family photos, vacation mementos, or lamps. The X decorative design, contrasts and adds to the radiator. Warm air can easily come through and the radiator has diminished visibility - its almost invisible. 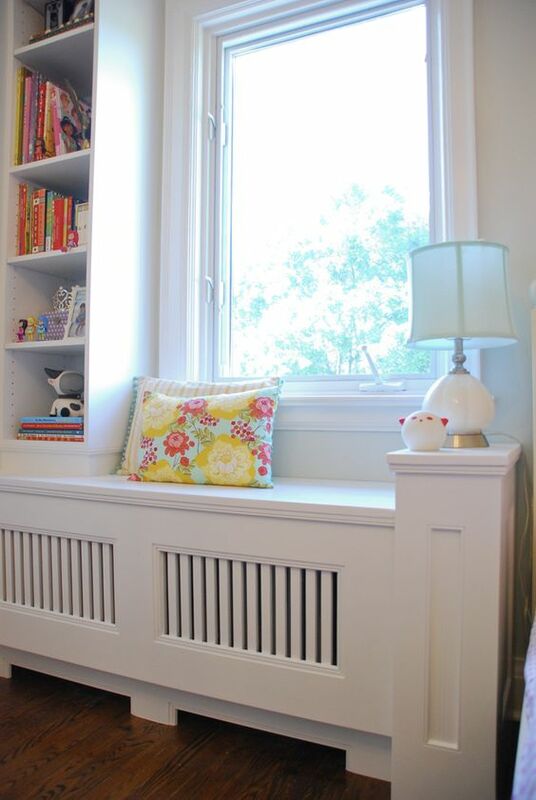 A reading nook or bench is another great piece of functional furniture you can create out of your radiator space. Adding individual throw pillows or a full length cushion easily creates seating space for one or more, somewhere to drink tea and relax or read. Radiator Cover TIP 1: you need access to the radiator whether its the thermostat, the on/off button, maintenance etc. so make sure you take that into account when designing or buying your cover. 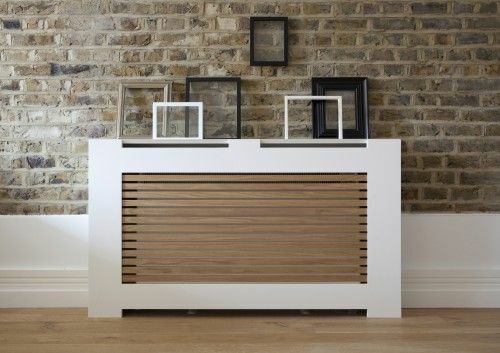 Radiator Cover TIP 2: your radiator cover will absorb some heat; which means you could lose some heat, take that into account when designing or choosing a cover. If you have a smaller window but still want to take advantage of a unified space, consider creating some storage around your radiator. 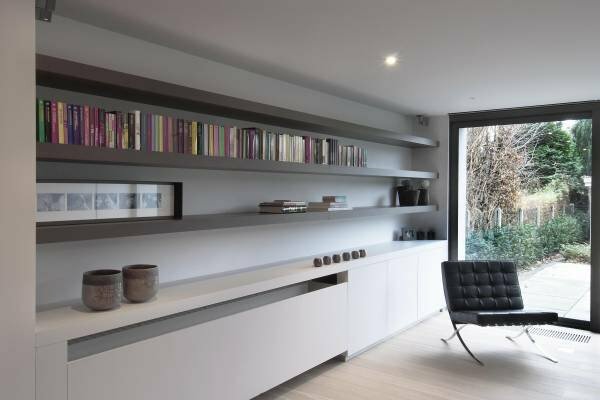 Whether its open shelving like below or closed shelving by adding doors, this is a great use of space. This look is understated, and because the shelves are painted the same color as the walls, it allows other things to take center stage. Even with smaller spaces, the radiator is not only less obvious, but all the space around it is used in a highly effective way. This is particularly useful if you need a combination; like this bench, bookcase and reading nook below. The radiator is in a corner, under a window. It was a usable space, but a little awkward. It is now the focus of the room. Set slightly off the floor, with squared wooden features, this unit allows the radiator heat to flow more evenly as well as giving the bench more character. 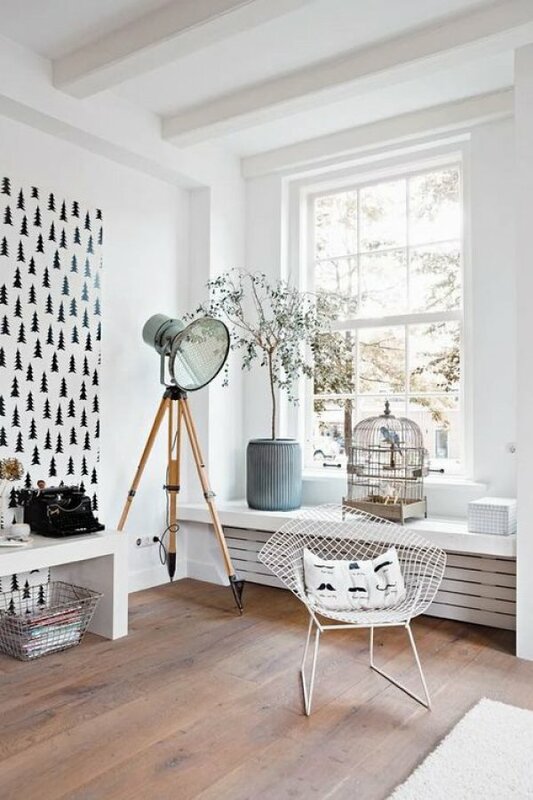 No matter what size your room or window, a radiator cover can make a big difference to your room; balancing proportions and adding style and color. Hallways, entries and other, more confined spaces present a whole range of issues when it comes to disguising your radiator. Good airflow for radiators is always essential, this is even more important in smaller areas. 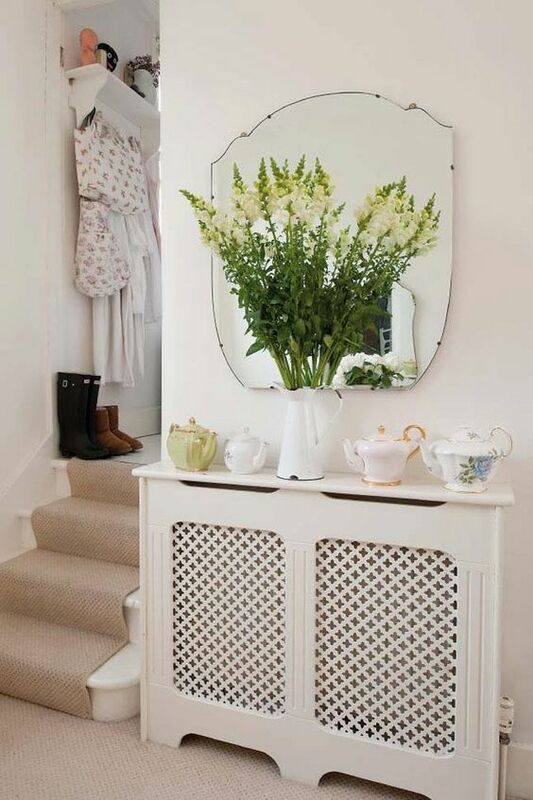 In hallways and entries, radiator covers are often thinner; but they can still create a focal point and be useful as a hallway table for lamps, mirrors and accessories like photos, vases and flowers. 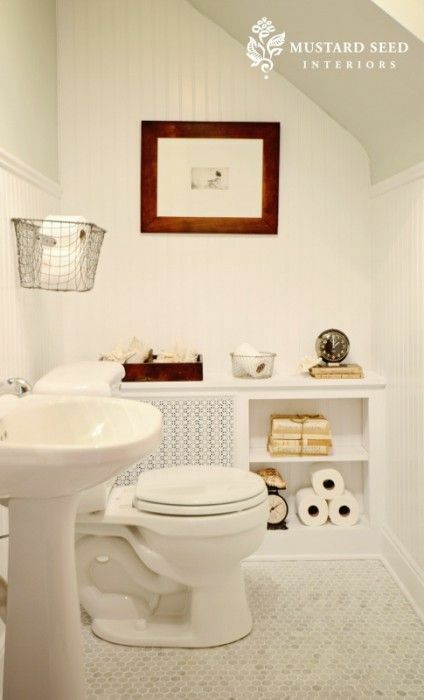 You can go as tall as you want, adding storage or a mirror above; use a simple cover or add doors for easy access. This is very useful in older homes or apartments where radiators are older and less stylish. A simple cover can hide the age of the home and a multitude of decorating sins by previous owners. If your radiator is in the middle of a room; effectively on its lonesome, you can use a variety of radiator covers to create functional furniture. Create a faux sideboard. Even without drawers, when it has the look and design style, it can still provide shelving for your family photos, books or lamp as an accent wall. Depending on your home, its age and your own decorating style, your radiator cover can be constructed from tempered glass, wood, or metal or a combination. 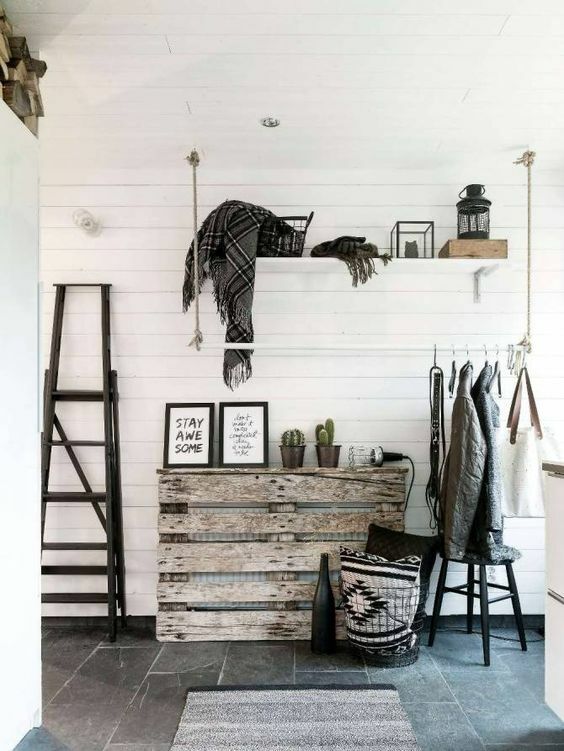 Even old pallets can be weathered, bleached or painted to create covers for a rustic or country cottage look. 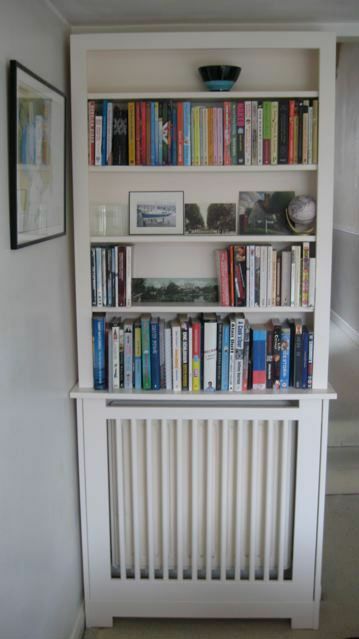 Your design can include shelves, a book case and other storage as a stand alone unit or as part of something else. If making a radiator cover seems too difficult, there are many wood and metal custom made covers available; like this selection at Amazon in a grey metallic finish. 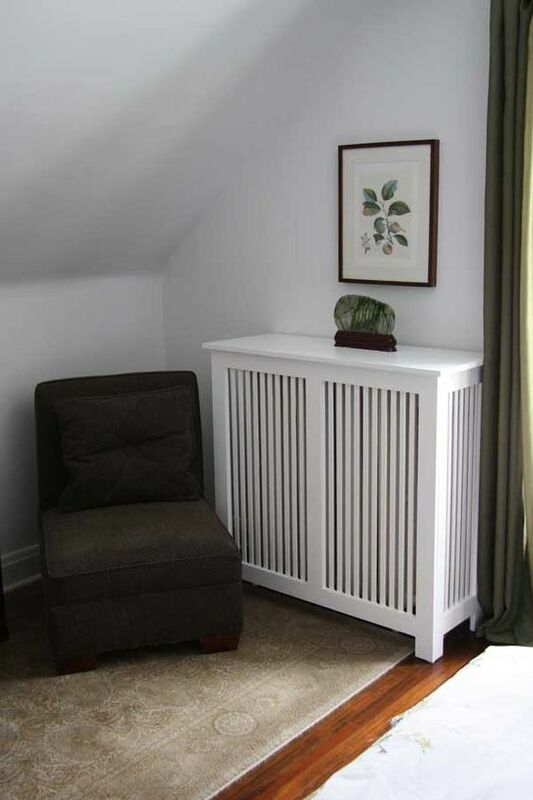 There are of course many custom cabinet makers who specialize in radiator covers. Corners are always a little difficult to accommodate radiators. From wood to metal, there are lots of designs to choose from. 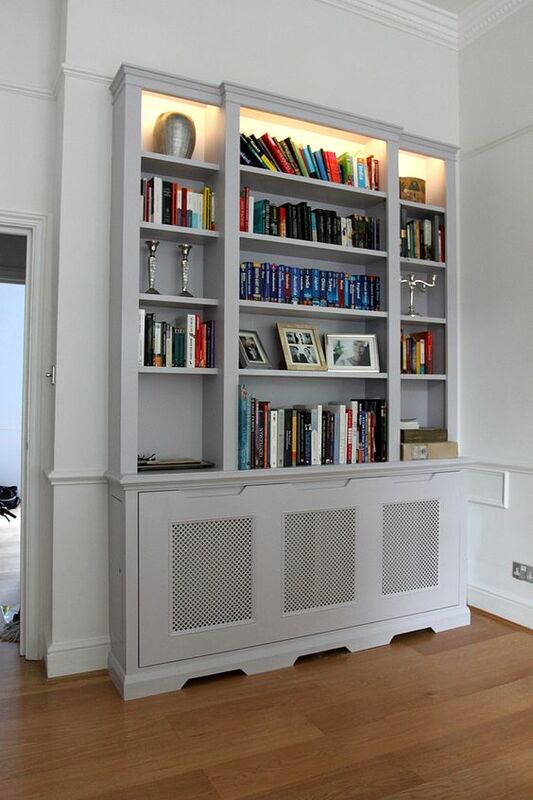 You can simply cover your radiator or add shelving or a bookcase to use the space above or around it. These few ideas should inspire you to go from a tired looking radiator to a wonderful feature you can use and hide your radiator. 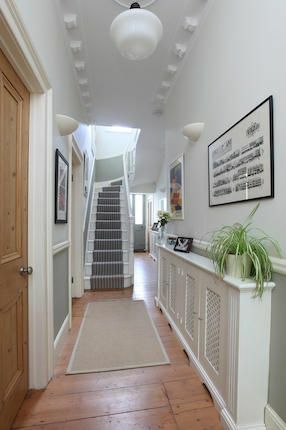 From bathrooms, dining rooms and tiny nooks, rooms really look finished, when radiators are hidden from view. 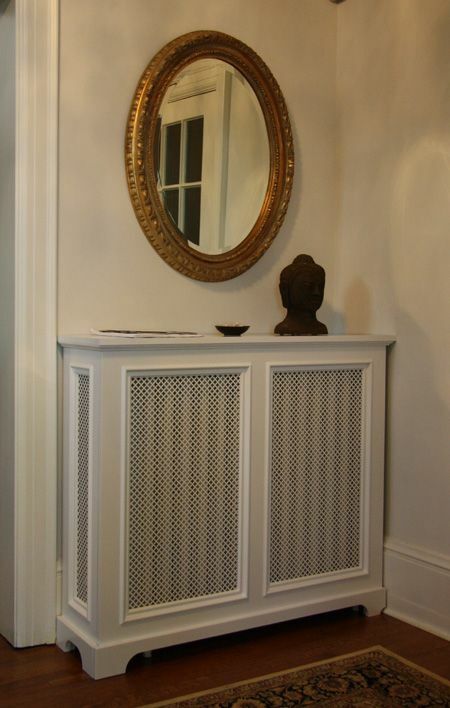 These radiator covers have transformed these rooms into great spaces. 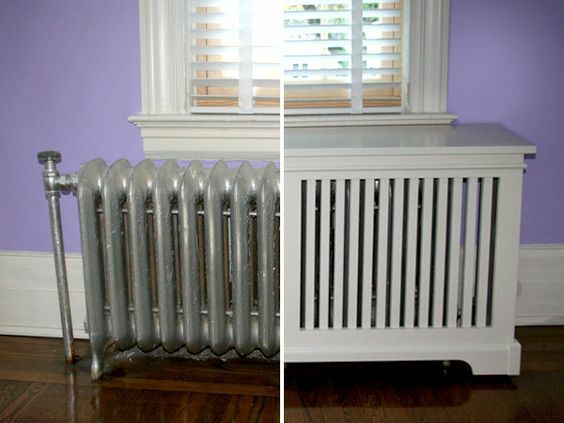 If you have a great radiator transformation; please let me know. Great ideas to cover radiators. Can you send tips on how you did it? I'm sure everyone would love to know. I've found a few at Amazon that might be of interest but not sure about the sizing. You might have to go custom. I take it that is 53" by 27". Let me know if you need more help and I'll research some more for you. just wondering how did you go with finding an under window radiator cover?